like sweet then you will surely like these sweet Gulgule. Make a thick consistency paste of wheat flour and sugar with water. Now add cardamom powder, its optional. Mix well. Heat the oil/ghee into deep wok or pan. Serve hot and cool sweet dumpling. 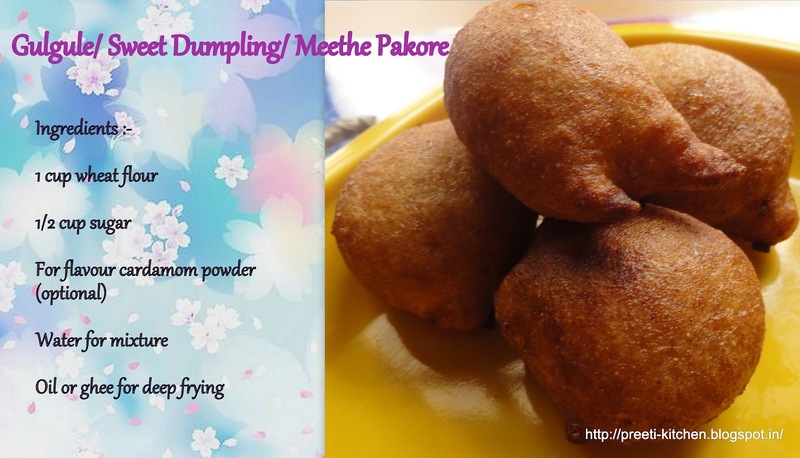 we too make this sweet version but we use urad dal paste for pakode will try this looks yummm…. i too make this, but we use to add mashed ripe bananas…looks perfect n yummy!! good one. My bhabhi had shared this recipe with me and we loved it. Quick n Easy to make snack!!!! Very delicious..looks good..and nice to know wheat flour is used..
New to me. Looks good.